The struggling Red Sox will get a boost as they finally play their 2019 home opener, as the club announced today that second baseman Dustin Pedroia has been activated from the injured list. Infielder Tzu-Wei Lin was optioned to Triple-A to create roster space. The 35-year-old Pedroia played in just three games last year and saw only limited action in camp. His surgically repaired left knee remains a long-term concern, but it’s evidently in good enough form to enable him to get back onto the active roster — and into the lineup. He’ll line up at his customary second base and hit seventh. When last we saw him in extended action, back in 2017, Pedroia was still capable of turning in a league-average performance at the plate. While he popped just seven home runs in 463 plate appearances and carried a marginal .099 isolated power mark that just barely topped his prior low point, Pedroia still displayed impeccable plate discipline and contact skills. Pedroia ended the ’17 campaign with a .293/.369/.392 slash. He continued to draw stellar grades for his glovework from Ultimate Zone Rating, though Defensive Runs Saved took a dimmer view. Baserunning was an issue, according to Fangraphs’ BsR measure, which graded Pedroia as a clear negative. He surely won’t ever be as spry as he once was, but Pedroia could still be quite a useful player for the Boston organization — if he can keep his knee in working order. The hard-nosed star remains under contract for $15MM this year and $25MM combined for the ensuing two seasons. Eduardo Nunez will surely spell him rather often to keep the joints fresh. Lin and Brock Holt (currently on the injured list) are among the options to fill in or supplement Pedroia as the season unfolds. Though the Red Sox have hammered out extensions with free-agents-to-be Chris Sale and Xander Bogaerts in recent weeks, president of baseball operations Dave Dombrowski strongly suggested that the team won’t be negotiating any additional deals, Jason Mastrodonato of the Boston Herald reports. The team has no ongoing discussions, per Dombrowski, who added that he is “pretty certain” there will not be another extension brokered this season. The Sox initially placed an Opening Day deadline on wrapping up negotiations, though the Bogaerts deal was announced a few days into the season. As Dombrowski explains, talks with Bogaerts were advanced enough that the team was confident they wouldn’t linger into the season. The Red Sox made some long-term investments in core members of their World Series team, though saying goodbye (maybe?) to some important relievers has left uncertainty within the bullpen. It didn’t take long for the Red Sox to bring back their World Series MVP, as Steve Pearce was re-signed to a one-year contract by mid-November. Pearce began the season on the injured list due to a strained calf but isn’t expected to miss much time before resuming his duties as Mitch Moreland’s first base platoon partner and a late-game pinch-hit candidate. His $6.25MM price tag is a bit steep compared to what other aging (Pearce turns 36 in mid-April) first base/DH types received on the open market, though it’s probably safe to assume that the team might have considered it an extra thank-you bonus for Pearce’s postseason exploits. Plus, if he replicates the .901 OPS he posted over 165 PA with the Sox last season, Pearce may suddenly look like a bargain. Speaking of Boston postseason heroes, Nathan Eovaldi posted a 1.61 ERA over 22 1/3 innings during the 2018 playoffs, including an instantly-legendary six-inning relief stint in the marathon that was Game 3 of the World Series. That performance was the cherry on top of an outstanding comeback season for Eovaldi, who missed all of 2017 due to Tommy John surgery before returning for a 3.81 ERA, 5.05 K/BB rate, and 8.2 K/9 over 111 regular season frames for the Rays and Red Sox. Beyond just regaining his velocity post-surgery, Eovaldi’s 97.2mph average fastball actually represented a new career high for the right-hander. 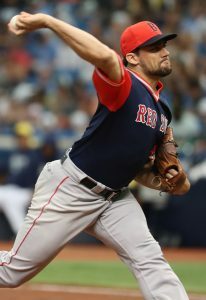 Now re-established as a quality starter, Eovaldi drew a lot of attention in the free agent market, though the Sox were helped by the fact that Eovaldi reportedly only gave serious consideration to Boston and Houston (Eovaldi’s hometown club). Boston ultimately re-signed Eovaldi on a four-year, $68MM contract. There is no small amount of risk baked into that signing, as Eovaldi has two Tommy John surgeries under his belt and has averaged just 121 innings per year during his eight MLB seasons. (The Phillies and perhaps at least one more of Eovaldi’s many suitors this winter apparently had interest in signing him to work as a reliever, which seems like it would’ve been a hard sell to a pitcher with so many rotation offers on the table.) Despite the concerns, Eovaldi has never pitched as consistently well as he did during his three-plus months in a Red Sox uniform, so it could be that the team’s vaunted pitching braintrust may have unlocked something within Eovaldi to give the Sox faith that the righty can be a front-of-the-rotation arm going forward. With some key players slated to reach free agency after the 2019 and 2020 seasons, Eovaldi’s deal also helped solidify the team’s core over a slightly longer term. The Sox took another big step towards this end by extending Chris Sale, keeping the ace southpaw out of the 2019-20 free agent market by inking him to a five-year, $145MM deal. We’ll address some of the concerns about the Sale contract in the next section, though in terms of pure performance, it’s hard to argue that Sale wasn’t deserving of such a financial commitment. Sale has the best K/9 (10.9) and K/BB ratio (5.29) of any pitcher in the history of the sport with at least 1000 career innings, to go along with a 2.93 ERA. Xander Bogaerts was the next 2019-20 free agent land a new contract, agreeing to remain in Boston for a guaranteed $120MM from 2020-25. The shortstop has generated 17.6 fWAR from 2015-18 and is coming off a 2018 season that saw him post his best numbers yet (.288/.360/.522 in 580 PA). A similar season could have pushed Bogaerts’ price tag close to the $200MM mark since he doesn’t turn 27 until October. Instead, now the Sox know they have Bogaerts in the fold for a $20MM average annual value through at least 2025, and maybe 2026 depending on a vesting option. Boston tried to shop its group of catchers all offseason long but never found a deal. Instead, the Sox kept Sandy Leon in the organization after he cleared waivers and accepted an outright assignment to Triple-A. This might count as something of a minor victory for the club, since Leon is still on hand to provide defensive depth behind Christian Vazquez and Blake Swihart. It was a relatively quiet winter in Beantown, and there was certainly more than a bit of speculation surrounding what moves the Red Sox didn’t make, rather the ones they did. With Joe Kelly gone to the Dodgers and a reunion with Craig Kimbrel looking unlikely, Boston’s bullpen is down its closer and one of its top setup men from 2018. The Red Sox didn’t address these vacancies in any major way — rookie Colten Brewer made the Opening Day roster after being acquired from San Diego, while some experienced names like Erasmo Ramirez, Zach Putnam, Jenrry Mejia, and old friend Carson Smith were brought into the mix on minor league deals. As it stands, Matt Barnes and Ryan Brasier will share closing duties, leading a bullpen mix comprised mostly of returning pitchers now expected on take on a larger role. Since Boston’s relief corps was pretty solid on the whole last year, it isn’t quite the nightmare scenario that many Boston fans are fearing. The Sox seem to be taking the stance that since they’re such overwhelming favorites for a postseason spot already, they can take the first couple of months to evaluate their relief options and see if anyone emerges. If not, Boston will likely pursue an established late-game reliever at the trade deadline (or they might do so even if Barnes and/or Brasier thrive, to add further depth). Of course, this is something of a risky strategy with the Yankees (or maybe even the Rays) poised to battle for the AL East title. Settling for even a middle-of-the-pack bullpen for a few months could cost the Red Sox in a division race that could easily come down to a game or two in the standings. While the Sox might still have an advantage over the American League as a whole, they surely want to win the division rather than tempt fate in the Wild Card game. Bogaerts’ extension came after the team’s self-imposed Opening Day deadline for extension talks, so we probably shouldn’t rule out any further deals. 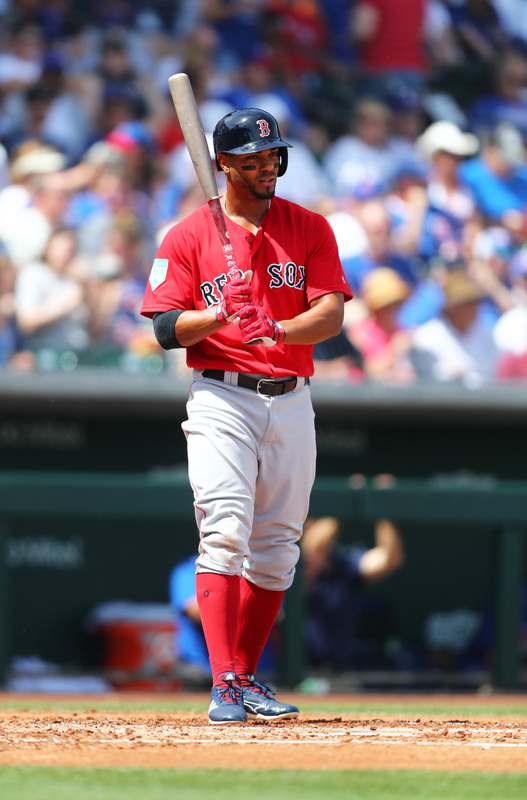 Still, there was more buzz about a potential new Bogaerts contract than there was about a new pact for pending free agent Rick Porcello, as the Red Sox didn’t seem overly interested in a new contract even with Porcello offering something of a discount. J.D. Martinez is another possible departure if he opts out of the final three years and $62.5MM left on his contract. 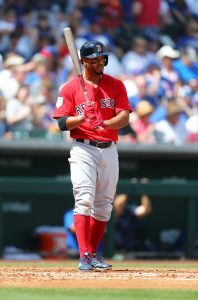 There also hasn’t been much traction between Martinez and the team in solidifying their future arrangement, though the Sox could be betting that Martinez chooses to stick with his contract rather than test a free agent market that has been increasingly hostile to defensively-limited players. Even with another elite hitting season, would Martinez land more than $62.5MM for his age 32-34 seasons, as he becomes increasingly closer to being a DH-only player? Martinez saw a limited market even last winter, and his situation might not improve now that he’d be two years older and with a compensatory draft pick via the qualifying offer (which the Sox would surely offer) hanging over his services. The biggest unanswered question is what it will cost to keep Mookie Betts beyond the 2020 season. Betts certainly doesn’t sound as if he’s considering signing an extension, so there might not have been much Boston could have done to get him to reconsider his stance on testing free agency (aside from a Mike Trout-esque offer). With two years of team control remaining, there isn’t necessarily any urgency to lock Betts up immediately, though his price tag only seems to be rising. Betts already rejected a $200MM extension offer prior to his MVP season in 2018, and retaining his services may take a $300MM+ commitment at this point. Boston’s major investment in Sale also carries some red flags. While Sale has been a durable arm over his career, his performance declined down the stretch in 2017, and he pitched just 17 regular-season innings after July 27 in 2018 due to shoulder issues (plus 15 1/3 innings over five postseason appearances). If health problems are only starting to crop up now that Sale has celebrated his 30th birthday, it doesn’t auger well for him continuing to stay healthy for the life of that extension. The Red Sox are also now averaging $75MM in salary to three rotation members in Sale, Eovaldi, and David Price through the 2022 season. Price has also had some health issues over the last few years, while Eovaldi’s injury history is well-documented. The question of money, of course, is at the heart of every transaction (or non-transaction) Boston made this winter. The Red Sox soared over the luxury tax threshold last season, topping the highest penalty level ($237MM) and thus faced slightly under $12MM in tax payments and a ten-slot drop for their first round draft pick. Even as the Competitive Balance Tax has risen to $206MM for 2019, Roster Resource has Boston’s projected luxury tax number at slightly more than $253.2MM, well over the $246MM threshold that would trigger another maximum penalty. If the Sox spend more than $246MM, their 2020 first-round pick will again drop back ten spots. They’ll also pay $14.4MM in taxes for their payroll up to that $246MM mark and an additional 75 percent tax on every dollar from that point forth. If that $253.2MM projection proves accurate, the Sox would pay a total of $19.8MM in luxury taxes. MLBTR’s Steve Adams detailed Boston’s payroll situation in a recent analysis of why the Sox were hesitant about re-signing Kimbrel, or making a lot of big splashes this winter. Extending Sale increased his luxury tax number, thus sending the team over the $246MM threshold and into the max penalty danger zone once more. With this in mind, the Red Sox were reportedly even open to trade offers for Bogaerts, Porcello, and Jackie Bradley Jr. this winter as the club looked to cut costs. Extensions to retain stars like Sale and Bogaerts, however, look to have been the only type of big splurge the club was willing to make to send it beyond the $246MM border this year. Any further moves the Red Sox could make are likely to wait until midseason, when their deadline pickups will only have two-plus months of salary commitments remaining. These pickups could include finding a reliever, maybe rotation depth, or possibly another second baseman in the vein of their acquisition of Ian Kinsler last summer. It’s still unknown how much Dustin Pedroia will be able to contribute in 2019, leaving Boston with a combination of Holt and Nunez until Pedroia is ready, with Tzu-Wei Lin, an injured Marco Hernandez, and top prospect Michael Chavis as further potential options. Second base is the biggest question mark around the diamond, as the Sox can be reasonably hopeful that Vazquez and Rafael Devers take steps forward from their mediocre 2018 showings to shore up the catcher and third base positions. Without a ton of bench depth and a lack of money to spend on more upgrades, however, Boston will again be counting heavily on its superstars. With all of these questions in mind, Fangraphs projected the Red Sox to take a big dropoff from their 108-win performance in 2018, as Boston is currently projected to win “only”…. 94 games. Needless to say, the Sox still look like heavy favorites to again reach the postseason, though they’ll be neck-and-neck with the Yankees all year long for the AL East crown.